Years ago, out of desperation, I discovered something: how to make money at my workshops where I let people decide what to pay me (at the very end of the workshop). Growing up, I’d watched street performers – magicians and jugglers – and dreamed of being one. What a life! You show up in a new town, throw down your hat and make enough money to get through the day. But then, years later, I found myself in Fairfield, Iowa in 2002 with an empty weekend workshop. The PWYC approach was my last ditch attempt to get people there. And it worked. And I made money. It astounded me. Since then, I’ve led almost every live workshop I’ve done (over two hundred) on a PWYC basis and refined my approach. 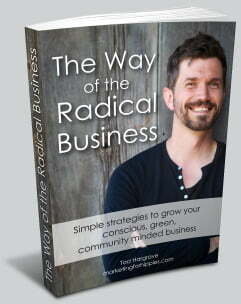 This eBook is my distillation and synthesis of what I learned. It is lean. There is no filler in this eBook. There were a lot of failed experiments. I’ve not brought those in. There are many experiments with PWYC in other industries (e.g. magazines, restaurants, massage therapy, yoga studios etc.). I haven’t included that either. This eBook is entirely focused on how you can use this pricing model to run profitable workshops. This approach is reliable. The approach I lay out how put me in very good stead. I attract more people to my workshops more easily. The vibes are wonderful. I am paid well. Seven Core Benefits of the PWYC Approach: There may just be more selfish reasons to do PWYC pricing than altruistic ones. Most people never consider this. Eleven Situations Where PWYC Seems To Work Best: Where in your business model might PWYC work best? It’s not for every business or every offer. Why PWYC Is Not More Spiritual: I see many people drawn to PWYC pricing as a ‘more evolved’ business model. Though it might surprise you, I disagree with this entirely. What Is The Differences Between PWYC and Sliding Scale? These are not the same things. They have a kinship but it’s important to distinguish between the two. What Are Some of the Mistakes You Might Make With PWYC? My oh my. There are some common pitfalls to avoid. When most people tell me, “I’m thinking about doing PWYC workshops!” and they describe their planned approach I cringe. I know it won’t work for them. It’s good to see the blunders for what they are. Risks of PWYC To Your Participants: When I began leading my PWYC workshops I thought I’d found the promised land of risk reduction and pricing. This made my workshops 100% risk free to those thinking of attending them. Or so I thought. But then I realized it wasn’t true. But seeing the risks showed me what to do to address them which made an immediate difference in my bank account. Risks of PWYC To You: Make no mistake, if you run your workshops on a PWYC basis, you are taking on economic risk. That is the double-edged sword of the proposition. It’s why it works so well but it can hurt you if you’re not careful. Most people are not fully cognizant of this walking in. “Doesn’t PWYC Devalue a Workshop?”: If I had a nickel for every time someone asked me this question… No. I doesn’t devalue it. But why not? There’s a fundamental error in this perspective. On Framing The Price – How Do You Ensure That You Are Paid What You Are Worth? : This section is worth the entire book. The solution I finally came up with is elegant, simple and results in the payments feeling better for everyone involved. You can’t just say, “Pay whatever you want!” and hope for the best. Hope is not a good pricing strategy. You must frame the price. But how to do that without it creating guilt or pressure? Five Key PWYC Suggestions: This is the most practical and nuts and bolts part of the eBook. I’ll share the five most important lessons I’ve learned. Just one of these quadrupled the money I made from my workshops. I couldn’t be more proud of this section. Your PWYC Sales Letter: How do you speak about PWYC pricing in your sales letters? I have thoughts. The PWYC Pitch – A word for word transcript of my PWYC Pitch: What you say at the end is actually not the most important part of my PWYC process but it does matter. It’s good to think through what you’ll say. To help you figure out your own wording, I offer you exactly what I say in the last seven minutes of my workshops. It’s a sort of closing to the ceremony of the day that invites people to pay while also diffusing the pressure. If you imagine feeling awkward about this, this section might just be a balm for your soul.